In 2012 Make Bread is offering incursions for school holiday programs only during summer and Easter breaks. Pizza, bread or bread roll making incursion is a fun and educational activity that appeals to kids of all ages. Hot Cross Buns making incursions are available throughout the Easter school holidays, half of which has already been booked. If you would like a morning filled with the aroma of freshly baked organic hot cross buns for your Easter holidays, please book now. Bread Making incursion can be incorporated into different topics and subjects, whether you are studying food, design or maths. We can tailor the incursion to suit your facility and the number of students. 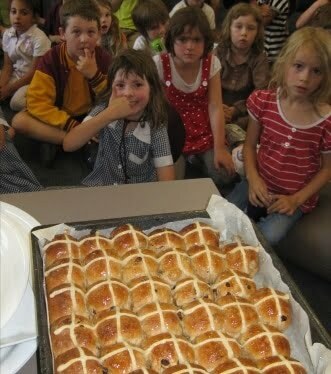 Hot Cross Buns making incursions are available only for a limited time from March 1st until Easter 2012. They are very popular, so early bookings are advised. For bookings and inquiries, please contact us here.